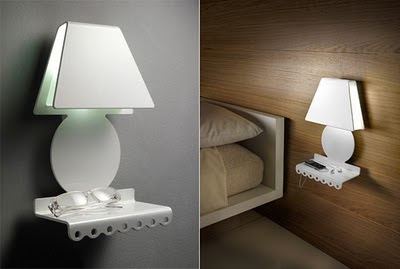 This lamp Sognibelli! is a kind of modern replica of an old lamp grandmothers. Created by Italian designers and Gabriele Pardi Laura Fiaschi and produced by Gumdesign Zeroombra Done in one piece of metal cut and folded, the Sognibelli can be placed on the wall in several ways, including as in the photo, just above the bedside table, creating an incredible visual effect. The flat side can be used to put small items such as sunglasses, phone, key, remote control, etc. With multiple color options that use LEDs, powerful and economical.